It’s ages ago that Russians began to churn butter for personal consumption. The first churns and butter-making plants emerged in Russia back in the 19th century. One of those, owned by the Bumans, a Danish family, was located in the vicinity of a northern Russian city Vologda. Since at the time foreigners were known for the use of advanced technologies, it was that plant that a Russian naval officer Nikolai Vereshchagin came to visit in 1875 to gain experience, for now that he was pensioned off he decided to launch an agricultural project. It was just then that the Buman butter-making plant sent to the World Exhibition in Paris 1000 tubs of butter that were rejected because of smelling of swampland. Vereshchagin undertook to establish the cause of it, and he thought at first that the smell was due to the water that was used to wash out the butter at the final stage of the technological process. They used milk for water, but with little success. The butter would not give up its smell. The pastures that the herds were grazing on were all swampland, for this is mostly the kind of land around Vologda. It was not until 1937 that milk had ever been pasteurized in Russia or elsewhere, that is it was not heated and then cooled to kill harmful bacteria. But the problem was that butter is churned from cream, and if cream were heated, it would just curdle. Vereshchagin had experimentally established that the optimal temperature to churn butter at was exactly 92.94 degrees Celsius. Also, only fresh cream of the 25% fat content had to be used. All these factors, namely cream pasteurization, cream freshness, fat content and the use of milk to wash out butter as the final link of the technological chain secured the Vologda butter the Paris Exhibition gold medal the very next year of 1876. The butter smelt of nut kernels and was in great demand, since everybody loved it. It came to be known as the Petersburg butter, after the Russian capital, since nobody abroad had ever heard of Vologda. But in Russia it came to be called the Paris butter for the Exhibition gold medal. And it was not before 1946, that’s after the Second World War, that it got its present name, the Vologda butter, after the area it has always been produced in. During the Soviet years the high-quality butter was made by just one Vologda plant, and the supply invariably failed to meet the demand. Today the Vologda butter is available at major supermarkets, where it is supplied to directly from Vologda and where it costs a lot, just as before, since it needs four times more milk to be made than ordinary butter brands. 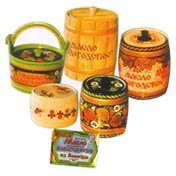 The Vologda butter is also known as butter of unmixed consumption because it shouldn’t be mixed with other foodstuffs, not to spoil its inimitable taste. To saviour the Vologda butter, put a tiny bit of it into your mouth and wait until it gets melted. The Vologda region remains the sole producer of the brand and is set on retaining the monopoly.